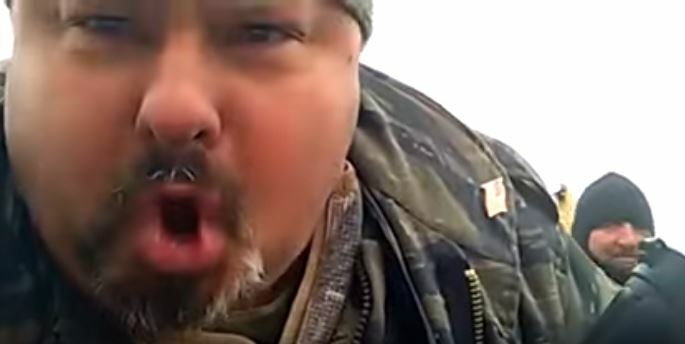 As the FBI surrounded the Malheur National Wildlife Refuge, some of the occupiers promised a “bloodbath” in a live stream video. The live feed from the DefendYourBase YouTube channel, which has been broadcasting on and off from the occupation, showed several militants operating a bulldozer. One of the militia members was dressed in military-style gear and carrying a rifle. The media has been ordered to leave, and that means they are coming to kill us. “The media has been ordered to leave, and that means they are coming to kill us and they don’t want them to see that! They’re going to murder all of us and the media are cowards,” the unidentified man yelled into the camera. The first militant then urged volunteers with military training to come to Burns, Oregon. “If they stop you from getting here, kill them!” he added. The video came after police and the FBI arrested seven militia members and killed an eighth. It also came less than a day after one of the remaining militia members, Gary Hunt, called to other militias for back-up on the Operation Mutual Defense forum. “You have an obligation to proceed to the Harney County Resource Center (the wildlife refuge) immediately, in order to protect the patriots still there. If you fail to arrive, you will demonstrate by your own actions that your previous statements to defend life, liberty, and property were false,” he wrote. Among the remaining occupiers is Lisa Bundy, Ammon Bundy’s wife. Ammon and Ryan Bundy were among the occupiers arrested on January 26.